Many of you are probably saying Chirin what? That was my reaction. I belong to a group on Facebook run by Louise Gale. Louise lives in Spain on the Costa de Sol. Lucky her. Every month, she posts a Creative Challenge for us. She gives us a topic and five colors. Then we create. Either, art, poetry, photography, whatever. This month, the challenge was Chiringuitos. Chiringuitos are little bars on the beach with thatch roofs. So the challenge was to create something that reminded of us of these. I have seen similar bars in Mexico. This is my contribution to the group this month. If anyone is interested, you’re welcome to join us. Check it our here. I’ve been having a look at previous posts on your blog, and I am so in love with the colourful art you make. 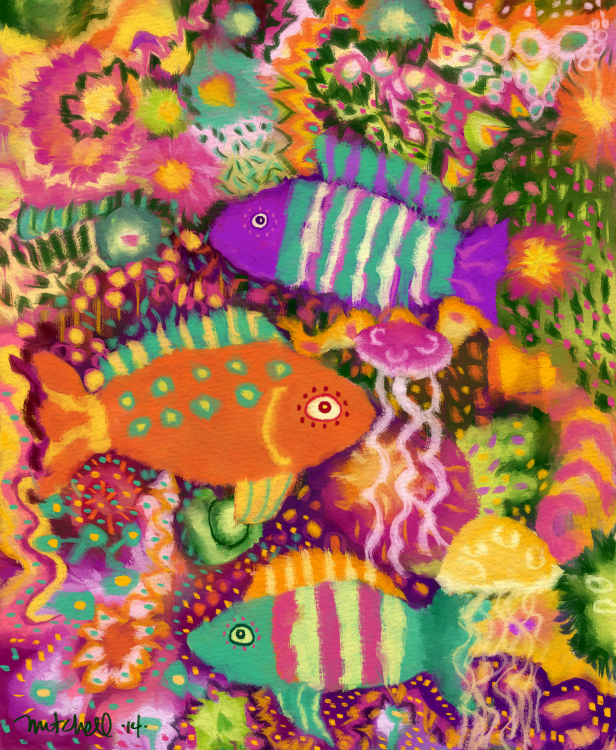 These fish make me happy just by letting the colours fill my eyes. Beautiful work! Thank you so much. I’m so glad you like the colors I use. Someone suggested that my colors might be too bright. So for a few paintings I used more muted colors. But, I had to go back to bright colors. They’re in my soul. I am so glad I got to see this. I love, love, love the colors and shapes. I think this was one of my favorite of yours. sorry, I could not help all the “loves” – I really meant it. I wasn’t being critical. I hope you didn’t think that. I almost added a lol after I said all those loves, as I thought you might get the wrong idea. Pretty neat concept and group Kerry. They look wise and happy! Thank you so much. I like that idea.